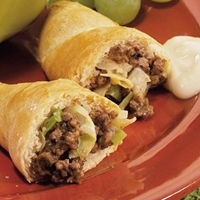 Easy meal; hamburger and cabbage inside a pocket of a crescent roll. add cabbage, salt and pepper, mix well. reduce heat to medium; cover and cook 10 to 15 minutes or until cabbage is crisp- tender, stirring occasionally. cool 5 minutes, stir in cheese. separate dough into 16 triangles; press or roll each until slightly larger. spoon about 1/4 cup of beef mixture on the shortest side of each triangle. roll up, startimg at shortest end of triangle, gently wrapping dough around the beef mixture and rolling to opposite point. pinch edges together to seal. place point side down on ungreased large cookie sheet. Another good post! Easy and comfy! THIS SOUND REALLY GOOD GONNA BOOKMARK THIS ONE CABBAGE AND BEEF,MY HUSBAND IS FUSSY BUT THIS I THINK HE WILL LIKE. You have done it again, another great post that has me craving some now. Great post. Have my 5. These sound great, they're quick and easy and best of all, they contain cabbage...yummm.